James Monroe was just 18 years old when he dropped out of college and joined the 3rd Virginia Regiment of the Continental Army. Monroe's connections and education enabled him to earn an officer's commission, being named a lieutenant despite his young age. During George Washington&apos;s famous midnight crossing of the Delaware River, Monroe was eight miles up river leading another party across to cut off communication lines between Princeton and Trenton. The two parties met in the Hessian camp at Trenton, trapping the German mercenaries by attacking from the north and south. Monroe was severely wounded in the attack, taking a musket ball to the shoulder. Dr. John Riker, who had joined Monroe&apos;s party after crossing the river, tended his wounds, likely saving his life. In 1777, Monroe was promoted to major. A year later, in January 1778, he joined the Continental Army at Valley Forge. Along with Washington, Monroe was one of two future presidents to have encamped at Valley Forge. 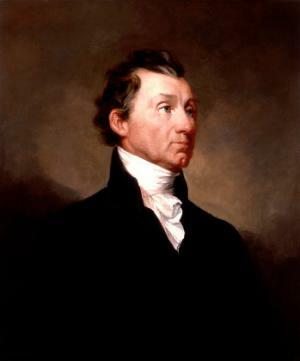 Monroe&apos;s political career began when he was elected to the Virginia House of Delegates in 1782 and culminated with his election as President of the United States in 1816, a post he would hold for a full two terms. Monroe passed away on July 4, 1831, becoming the third president to die on Independence Day.